you don’t want dust or insects crawling in. Leave it to sit on the kitchen bench. After about 2 or 3 days, depending on the temperatures in your house, it will begin to bubble and ferment. That is good. Fermentation is a healthy process. Every day for 7 days, feed the plant 1 teaspoon ginger and 1 teaspoon sugar, and stir. as you can in to the bowl. ginger mix. Stir and bottle in plastic bottles. Place the caps on the bottles but don’t screw them on. 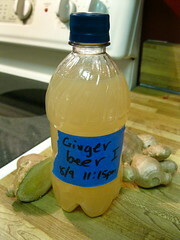 Leave the ginger beer on the kitchen bench for a couple of days to ferment a little more, then tighten the caps. When bottles are firm place the bottles in the fridge. Time will vary depending on temperature, rock hard is the level of carbonation desired. Placing it in the fridge will slow the fermentation process to almost zero. Well chilled over ice as desired.